There are some indirect lessons for Atlantic Yards watchers, I think, in New Jersey journalist Steven Hart's recent book about the construction of the Pulaski Skyway in New Jersey. 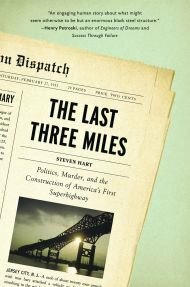 The Last Three Miles: Politics, Murder, and the Construction of America's First Superhighway, covers the story behind the 1932 opening of the final link that would connect New York City and the Holland Tunnel (1927) with the mainland highway system, thus diverting traffic that had clogged local roads and Jersey City streets for five years. As the subtitle indicates, there's a rich story of conflict between labor and business, as well as the overarching role of Jersey City political boss Frank Hague. But for those of us in Brooklyn, it's useful to consider Hart's suggestion that this project be included in courses concerning failures in design. The Pulaski Skyway should also be a part of those classes, if only as an example of a quieter kind of failure--a failure rooted not in recklessness, but lack of background knowledge. The designers of Route 25 and the Skyway that is its most visible section were visionaries doing something that hadn't been done before. They weren't the only ones thinking in terms of superhighways--the first German autobahn was completed the same year the Skyway opened--but they were under the gun, and they had little experience in the field of traffic engineering to draw upon. The result was one of the most visually spectacular and functionally impaired mistakes ever made. "It was hailed as the highway of the future," Hart said on the July 6 Leonard Lopate Show. "It's design flies in the face of everything." Could an arena work near the corner of Atlantic and Flatbush avenues, part of a project of unprecedented density? On the one hand, it would be near a transit hub. On the other hand, the area is already congested, and tactics to limit congestion have been proposed rather than implemented. And Hart offers an observation that lingers as a truism about the pressure to complete major projects. The construction industry is uniquely vulnerable to outside pressure. Many different types of craftsmen are involved in the construction of a larger building, and their work must be choreographed with almost balletic precision. The builder has taken out large loans at high interest rates; quite often he has equity partners demanding a quick return on their investment. A delay in one area of the construction project translates into additional expense, and a longer wait before the building is finished and ready to generate income through rent-paying tenants. We don't know exactly how much money Forest City Ratner has put up, but we can assume that the reward is more than commensurate to the risk. But there is money out there, and that's why U.S. District Judge Nicholas Garaufis, presiding over the Atlantic Yards eminent domain case, observed that "time is fleeting." Now, that timetable is an issue for an appellate court.